Which herb should I use? The more people I talk to the more I realise that knowing which herbs are great with which dishes or meats isn't as common as I thought. I think the more recipes you try, the more of an idea you have because you know from experience what herbs work well. However, if you are like me and nine times out of ten you don't use a recipe (especially not for mid-week meals) then it's a case of grabbing something out of the spice rack that you know is safe. I thought it may be an idea to look into my favourite herbs over the next few weeks, look at what they go great with and some recipes I recommend trying them with. Basil is one of my favourite herbs to cook with, mainly because my Mum had such a love of Italian flavours that I grew up with it. 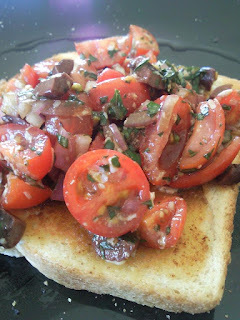 It has a nice sweet flavour that seems to go amazingly as a rule with anything tomato. My favourite recipe to use basil in is spaghetti Bolognese, followed by bruschetta (re - which is amazing with fresh basil. However having dried basil in the pantry is especially as good. The only rule to remember cooking with dried herbs over fresh is dried herbs need time to cook off slightly to release the full flavour. So if throwing in dried basil in your Bolognese sauce make sure you add it in with your garlic - before your tomatoes - and you'll taste the difference. Where as with fresh basil in a sauce, adding it with your liquid before simmering is better. If you want to grow basil I would recommend Thai Basil which has such an intense flavour! However, if you live in an area which experiences seasons (South-east Australia) then just keep in mind that it will die off in winter. For me - I love basil with chicken the best. And I absolutely love basil with creamy sauces, such as a garlic sauce to go over chicken or a pasta. Do you have any herb you would like me to look into next time?